On the ninth day of the ninth lunar month, Chinese celebrate Chongyang, a festival where filial piety and respect for the elderly are recognized. Liu Zhihua takes note to look at how the elderly in China live better and longer. Aging is part of life. In China, where the philosophies of Confucius and Mencius prevailed for thousands of years, aging also means an increase in wisdom, rather than the absolute decline of body. On the ninth day of the ninth lunar month, which fell on Tuesday this year, Chinese across the country celebrated the Chongyang Festival, that one day in the year that is specially reserved for the elderly. For the Chinese, it means a day out with the family, climbing the hills, appreciating the seasonal chrysanthemums, drinking chrysanthemum wine and eating the cakes specially made for Chongyang. It is a day dedicated to the old, who have always had a special place in Chinese culture and in modern China. Apart from the respect and care owed to them from younger generations, the gray generation also draws benefits from the practice of traditional Chinese medicine (TCM), which is not just about treating illness but, rather, is about the holistic approach of maintaining body, mind and spirit. "The essence of TCM is to keep a balance within the body and between the body and mind, and then to achieve harmony with the outer world," says Wang Weigang, an experienced TCM practitioner with China-Japan Friendship Hospital in Beijing. "When such balance is achieved, people will not have physical or mental problems." Wang goes on to give an example of how it works. The stomach and spleen share the properties of tu (the element of earth), which is the opposite of mu. If opposition between these two elements becomes too strong, the body will become uncomfortable. By the same principles, fish, pork, duck, lotus root, Chinese yam, asparagus, lettuce, lotus seed, apples and bananas are good foods for spring, while chicken, mutton, beef and oranges should be avoided. All this is to calm the liver, and reduce the burden on stomach and spleen, Wang says. For thousands years, TCM has taught the Chinese to eat, exercise, dress and rest in certain formulas of harmony, conforming with the changes in seasons and hours of the day. It also advises people to keep emotions stable and diminish desires to help keep the body at optimum health, Wang says. "TCM is not just theory but also is about lifestyles that people can practice in daily life," says Wang Guohua, a TCM professor and practitioner with the prestigious Beijing University of Chinese Medicine. Acupuncture, herbalism, massage, food therapy and exercise, such as tai chi, are ways through which TCM restores and builds up the body's strength to maintain health. "Nobody believes I'm almost 80," says Beijinger Wang Shuzhen, who still has a head of mostly black hair and very few wrinkles. "I follow the old adages on how to live healthily, and I do tai chi. I have been strong since I was a little girl, and I like exercise. I cannot say I'm healthy only because I do tai chi, but it must be one of the prime reasons." 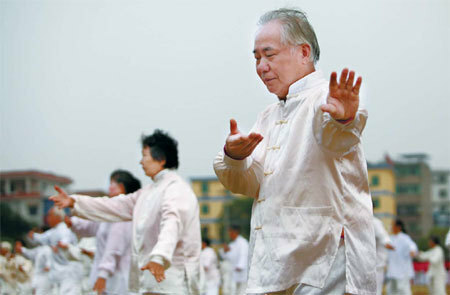 Tai chi is very popular among elderly Chinese as a form of morning exercise. It is said to have the benefits of improving balance, sharpening the mind, enhancing circulation and boosting cardiovascular strength. Yang Songquan, a tai chi instructor, claims he never catches colds because of his exercises, which he has practiced since he was 4. He now has many disciples in China and abroad. "Tai chi is like a book that everyone can read anytime, anywhere," Yang says. "It only requires you to be perseverant." Yang has been teaching tai chi in Beihai Park at Beijing since 1988 without any break. "When I first practiced tai chi, I had to wear a thick down coat in winter. Gradually, I was able to wear less and less," says 55-year-old Yu Wen, one of Yang's students. In early 2003, Yu broke her leg and was confined to bed. She developed a severe lung infection. She chanced upon some people practicing tai chi in the park and started learning it out of curiosity. "I was so ill at that time, and now I'm healthy. I don't have high blood pressure or other chronic diseases," Yu says. "It is impossible to get rid of illness just through tai chi or drinking TCM herbal infusions, but it improves health." And that's all there is to it. In China, at least, tai chi and TCM are the twin drivers that help elderly converts keep a better balance and grow older and wiser. Contact the writer at liuzhihua@chinadaily.com.cn.